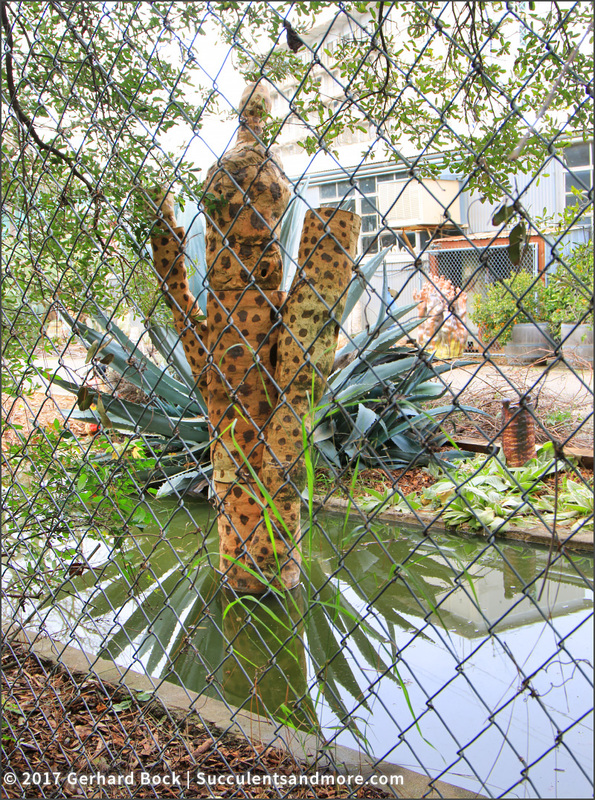 A massive Agave americana, 6 ft. tall and at least 8 ft. wide, hiding behind a mysterious ceramic sculpture and reflecting in a basin filled with murky water. This Agave americana outgrew its pot and cast it off altogether. Who knew that containers were optional? 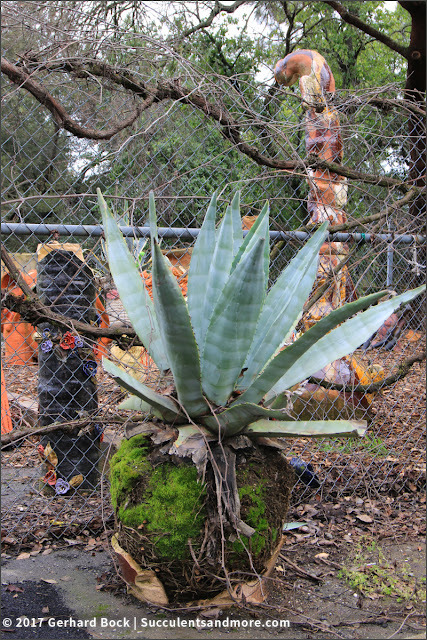 Sticking my camera through the locked gate, I photographed the large Agave americana you saw at the top of this post. But what are all these ceramics? They have a cast-off look about them. Is this a ceramics graveyard? 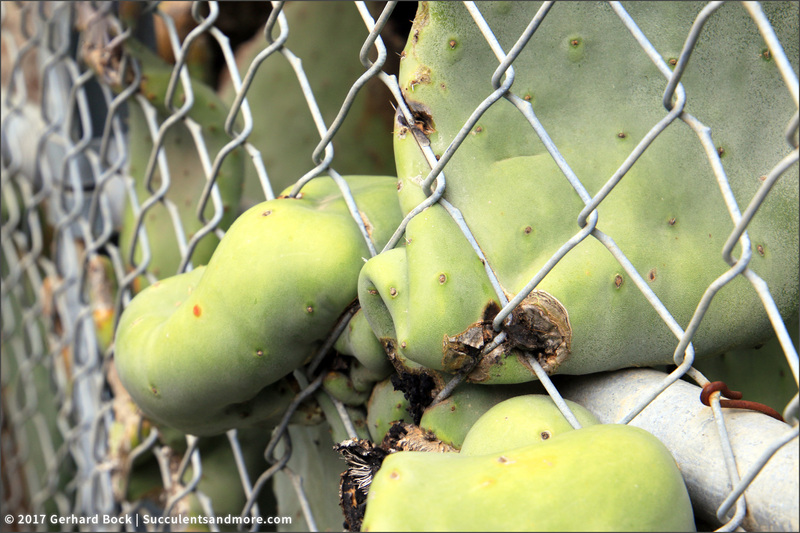 Nothing can stop a prickly pear! The 7,200 sq. ft. building was bought from the federal government as war surplus in 1947 and used as a dormitory building, fondly referred to as The Warehouse. In 1951 the building was converted to a combination police station, mailroom, and storage area. 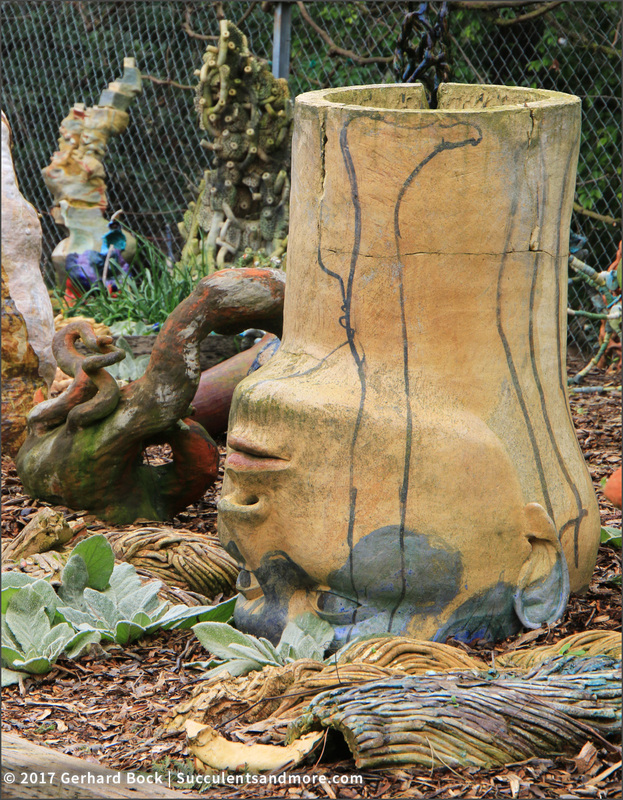 The art department began taking it over in 1961; Robert Arneson arrived in 1962. 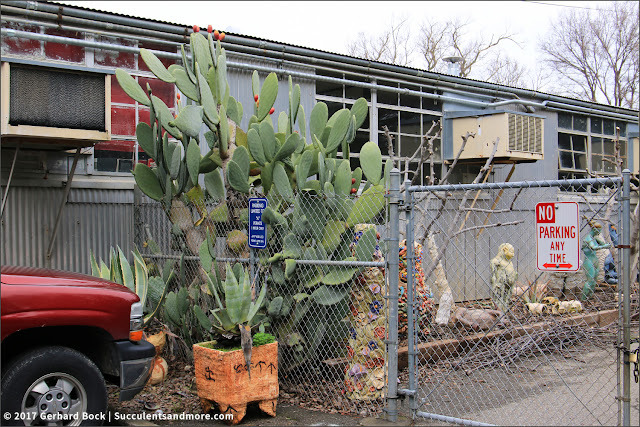 By the end of the 1960s the entire building had been given over to the ceramics program and a metal foundry. Robert Arneson was a ceramics professor at UC Davis for more than 30 years (he passed away in 1992). His works are in many public and private collections. 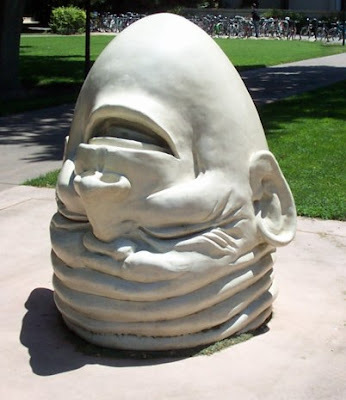 He is most famous for his Egghead series. 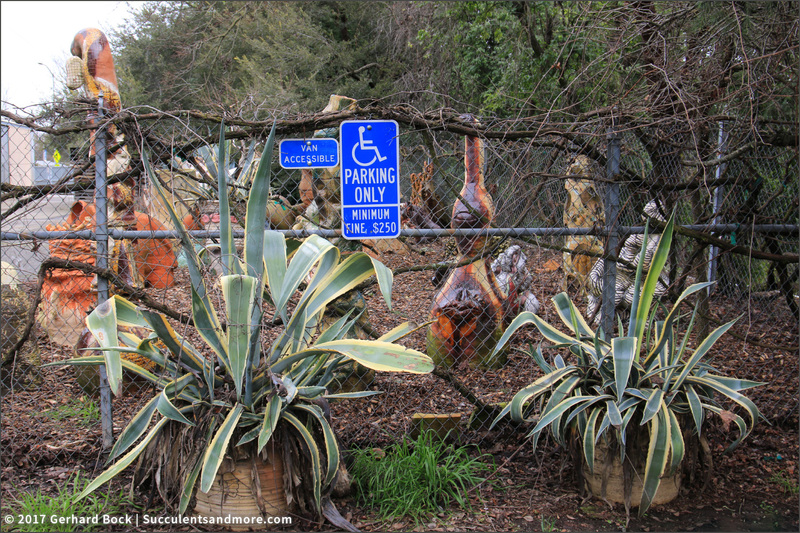 The last seven of them were installed on the UC Davis campus after Arneson's death, and today they are a beloved community treasure (photos below from Davis Lokal Wiki, attributed to LocalWiki Contributors). Amazing how much I still don't know about a town I've lived in longer than anywhere else in my life. Even more amusing is the fact than a lowly agave was the catalyst for this unexpected journey of discovery 10 minutes from my own house. Isn't it cool what a camera and gardening leads you to find? And in your own neighborhood. My high school art class was held in a very beat-up WWII surplus quonset hut. Art classes get the leftover spaces--it is the football team that gets the new stuff. Yep, that's how it goes. And yet art benefits so many. 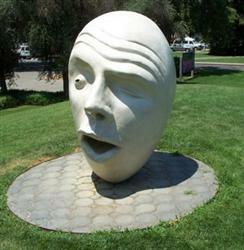 I bet those egghead statues are among the most photographed attractions on the UC Davis campus. And they were made in that lowly temporary building. I thought so! 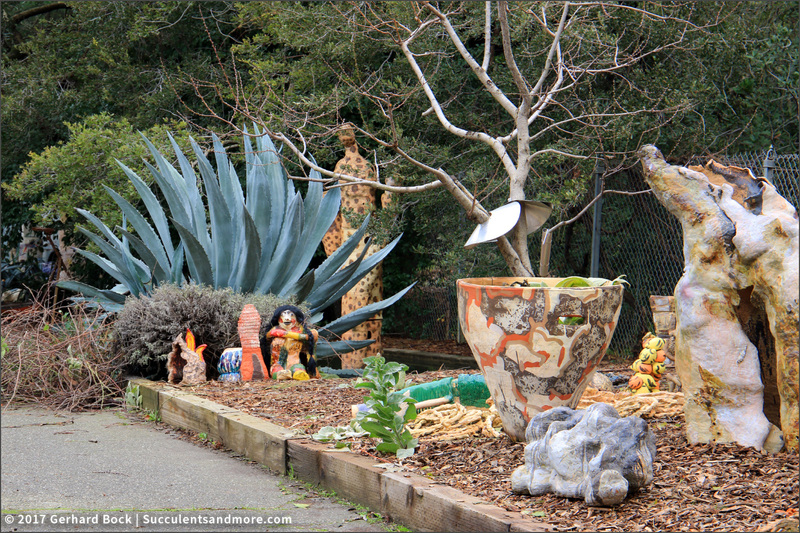 I'm wondering if those ceramics are for sale? I'd love a few for my own garden. I like that upside down head pot (5th photo). I hate to think that it's been left there to disintegrate, even if it does appear to have quite a few cracks. I wonder what other treasures the university has hidden in corners of the campus? I'm not sure what the fate of these ceramics is. I'll see what I can find. Well that's just fabulous, great find Gerhard! Love the agaves, of course, but that opuntia...ha! All of this benifetted from your artistic eye behind the camera...well done! 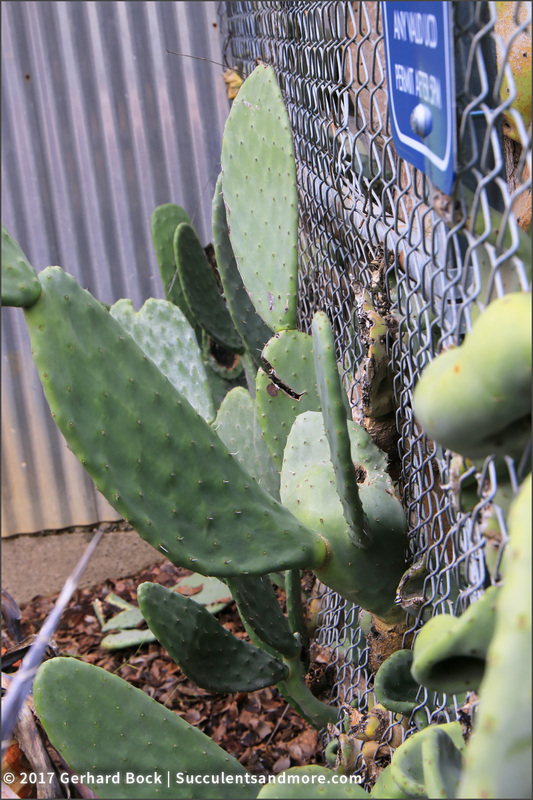 Heather spotted that opuntia first. It's become one with the fence. Neither one can be removed now without the other. 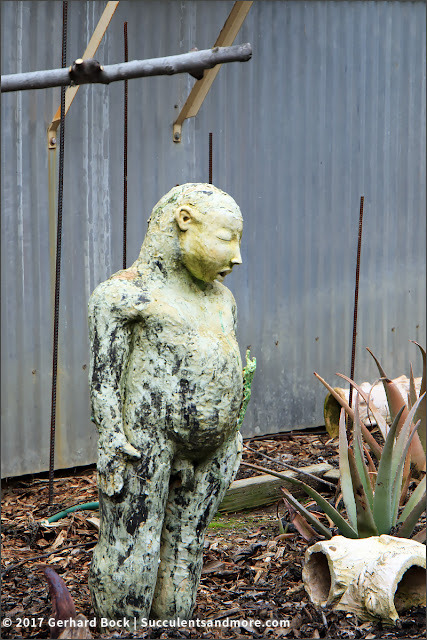 Nice ceramic sculptures, interesting and tasteful lot! I wonder if they are cast offs? I was wondering that, too. If they're castoffs, they should let me know. I'd be happy to take a few off their hands :-). I find that plants take me to all sorts of interesting places too. What an intriguing ceramicist. And I wish there were still cheap war surplus buildings like that around! Denise, you're the queen of chance discoveries in my book :-).